Joining a cycling club is a great way to meet other cyclists and to step up from being a ‘Sunday’ recreational cyclist to that next level. Traditionally they have been primarily focused on racing rather than just riding but they are beginning to reinvent themselves as the popularity of cycling grows to accommodate riders who don’t necessarily want to race, and to welcome women who have not always been attracted to clubs. When you join a cycling club in Australia you are actually signing up as a member of Cycling Australia which gives you a number of other benefits including public liability and personal accident insurance. On the Cycling Australia website under membership you can search cycling clubs in your area within a 5 km, 10 km, 25 km or 100 km radius, giving you a good shortlist depending on how far afield you are willing to go. Once you have a shortlist you need to decide what your priorities are to find out what each club can offer you. You could consider criteria like location, whether skills training is offered, what training rides are available, the number of female members and the support given to female riders, racing opportunities for women, and of course what social activities are included. I actually wrote a longer article on this subject for Bicycling Australia magazine so if you want to read the full account then track down the most recent issue of the magazine. The St Kilda Cycling Club (SKCC) in Melbourne’s inner east is by far the standout club in Australia for women’s participation and membership. The club runs a number of women’s only training rides from entry level to race training. For racing SKCC offers three women’s only grades at its weekly criterium races, but if you live on the other side of Melbourne you could join your local club, and then travel to South Melbourne to race on a Sunday morning in women’s only grades. 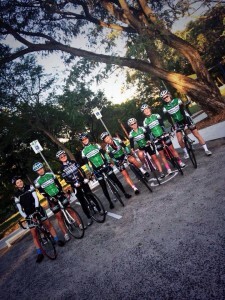 Kangaroo Point Cycling Club (KPCC) in Brisbane ran a women’s training program this year to assist women who are new to racing and want to gain the required skills and fitness to ride in the Club’s principle race of the year – The Upperlimb.com Cunningham Classic. The coach who is running the program specifically joined KPCC because of the focus on women. There will also be dedicated women’s only grades for the first time in this year’s big race, making it much more accessible to new female racers. They also have a focus on welcoming new women to riding and have a regular women’s only ride. KPCC Club Co-captain Alix Everton reports that last year KPCC ran a women’s novice racing tour which included three weekends of skills training and they are currently working on a women’s only racing program for 2015 which will incorporate skills development and racing, with a focus on providing a safe, fun and supportive environment. Dulwich Hill Bicycle Club in Sydney’s inner west makes a deliberate effort to offer an entry level within their club for both men and women. Club President Eleri Morgan-Thomas says “Pretty much anyone can manage Saturday Slowies and it’s quite inclusive. We ride safely and in a bunch over to Centennial Park and people can do what they want – some do hard training, others ride around and chat. Then we ride back together. This year we have had upwards of 40 riders on the way back to Marrickville of all ages and abilities. If you live in Adelaide you have the option of joining a women’s only club. The Skinny Lattés is a women’s only cycling club, one of the only ones in Australia and was formed in 2002 by three girlfriends Felicity Laing, Lynette Collins and Belinda Bramley who recognised a need for a women’s specific cycling group. The Club currently has about 90 members and while they encourage their members to try racing, it certainly isn’t the Club’s main focus. When you contact the clubs on your shortlist, one of the questions you should ask them is how many female members they currently have in their ranks. Kangaroo Point Cycling Club boasts more than 50 members which is about 25 per cent of its membership. There aren’t too many clubs around that can claim those numbers so don’t be disappointed if you find the numbers are low in the clubs in your area. You can always start your own ‘female only activities’. Don’t be put off if you don’t find what appears to be your ideal cycling club nearby. You can always form a women’s committee and start organising women’s events within an existing club. That’s certainly where it all started at St Kilda Cycling Club and they are now the envy of many others.